This valuable Crocus-species grows anticyclically. Flowering is therefore possible from October till April. Our students help cultivating and harvesting in their practical lessons. They pick three filaments from each single violet flower and dry those afterwards. 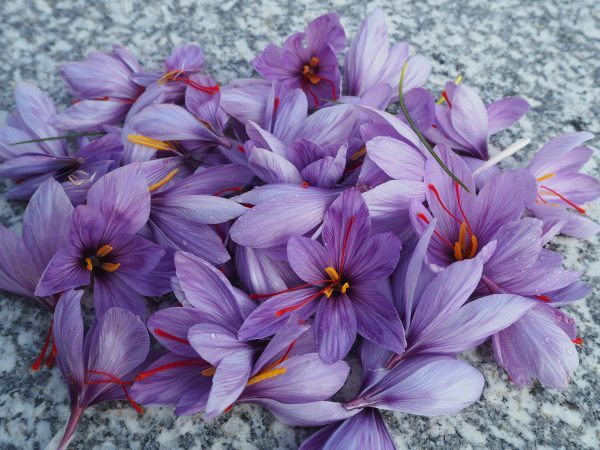 About 160 flowers must be harvested in order to get 1 gram of saffron. Until 100 years ago Austria was a centre of saffron cultivation in Europe. This precious spice was especially cultivated in the Danube valley Wachau as well as the Weinviertel (wine quarter in Lower Austria). The horticultural school Langenlois revives this old tradition so that the students get access to the old knowledge about this handpicked treasure. The teachers and the employees working in this centre of education of horticulture not only are pioneers in the organic and sustainable maintenance of gardens and green spaces but also know how to make old knowledge alive. Saffron originally derives from the Himalayan Mountains and has a more than 3,500 year long history of cultivation. In the 12th century saffron came to Europe via the Silk Road and has been cultivated since then. Saffron is unknown in the wild. Propagation is only possible through humans by hand – it does not escape cultivated land by self-seeding. Saffron (Crocus sativus) can easily be mistaken as the poisonous meadow saffron (Colchicum autumnale) – so be careful and watch out: crocuses have 3 stamens and 3 styles, while colchicums have 6 stamens and 1 style and are toxic. Saffron has been cultivated again in Austria already for 10 years. The local climate and the soil conditions are very suitable for growing this sumptuous spice.